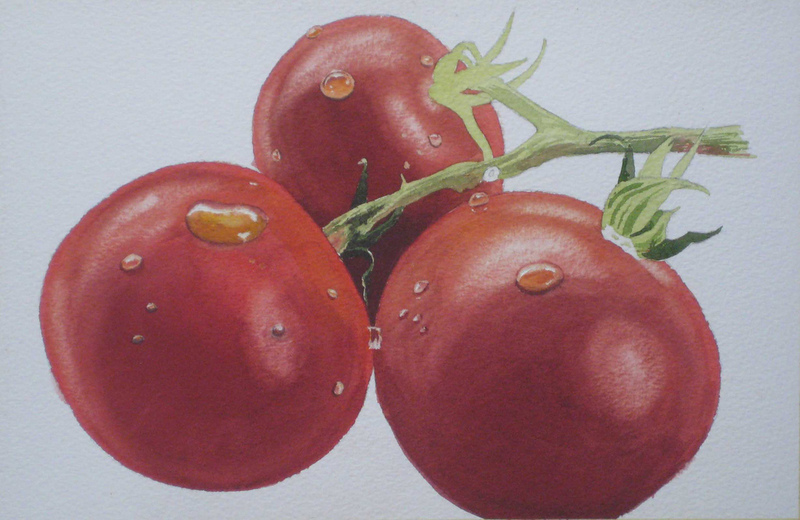 Another in my series of watercolour demos based on class projects. 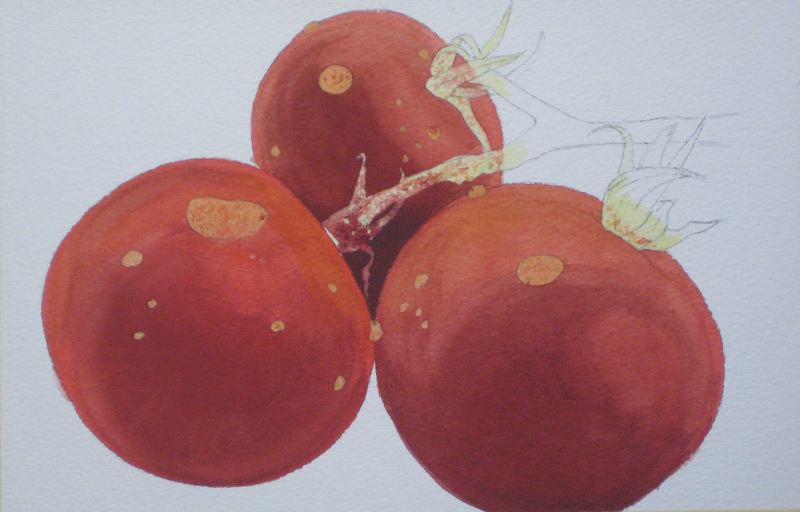 This step-by-step watercolour is based on a photograph by Sylvia Lang, posted on July 9, 2011, in the website Paint My Photograph (PMP). I thought it contained many techniques my Intermediate watercolour class could master. Image size 7″ x 11″ on Arches 300 lb cold pressed paper. 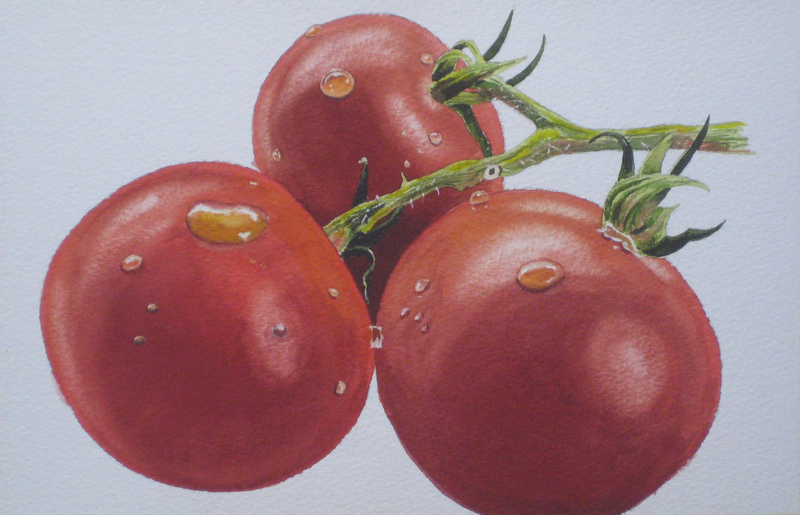 using Winsor & Newton Artist quality colours. 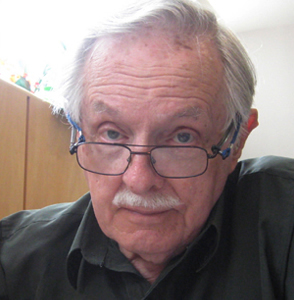 I always begin my projects with a carefully drawn image, and I usually sit down quietly in front of my reference photograph and line drawing to plan exactly how I will paint this project. I will often write this down in point form, detailing when I will apply any appropriate masking, what colours come first and where any negative painting is required. This helps me if I’m away from the project for a few days or working on something else. I’m able to quickly pick up where I left off. I also use more than one palette, so the existing colours are easily reconstituted again. 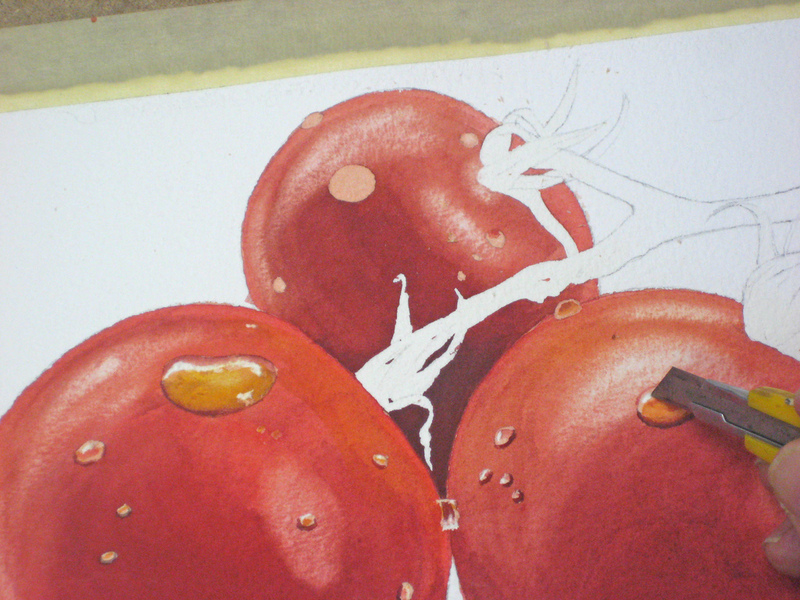 Here I’ve applied some masking fluid to the stems prior to painting in the first wash over the tomatoes. 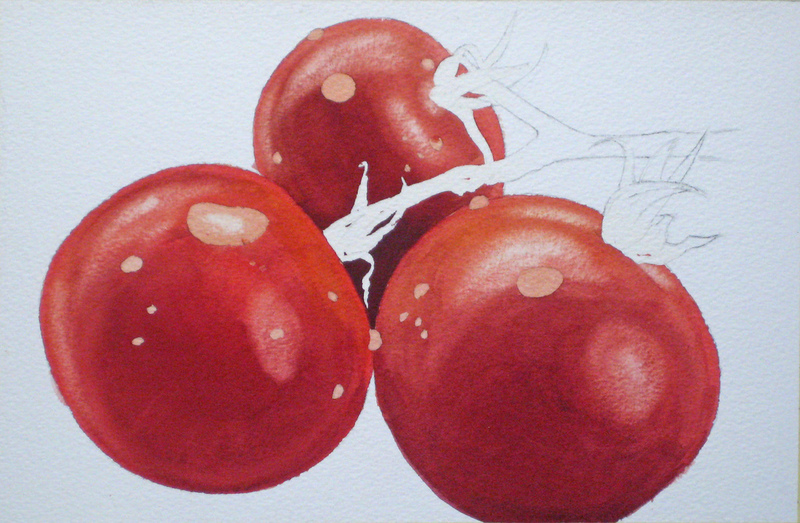 The first wash was a mixture of Winsor Red, plus a touch of Alizaron Crimson and New Gamboge. I find Winsor Red ideal tomatoes, strawberries and red peppers. 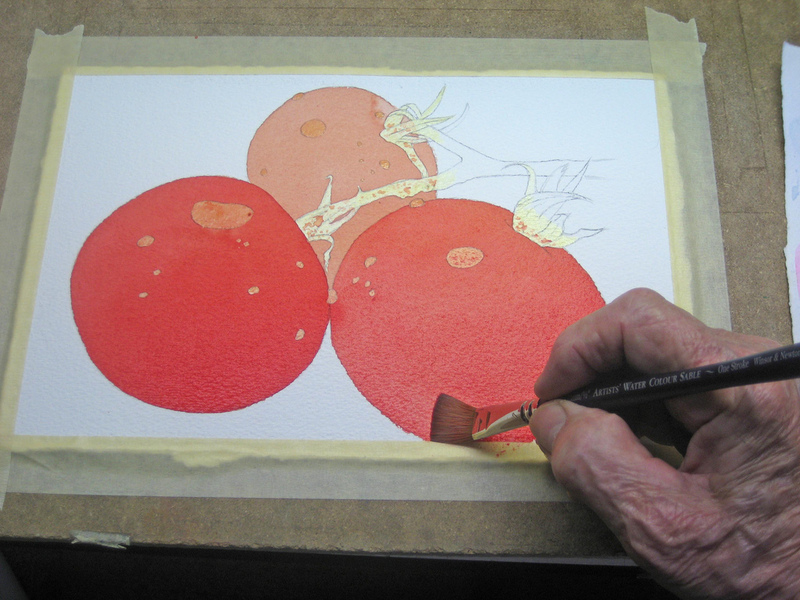 You may notice a small “blossom” at the top of one tomato where I carelessly touched it with a No.4 brush to pull some colour in. No problem, as this will be corrected with later washes and colour lifting. Next I apply a stronger wash of Winsor Red with a touch of New Gamboge. 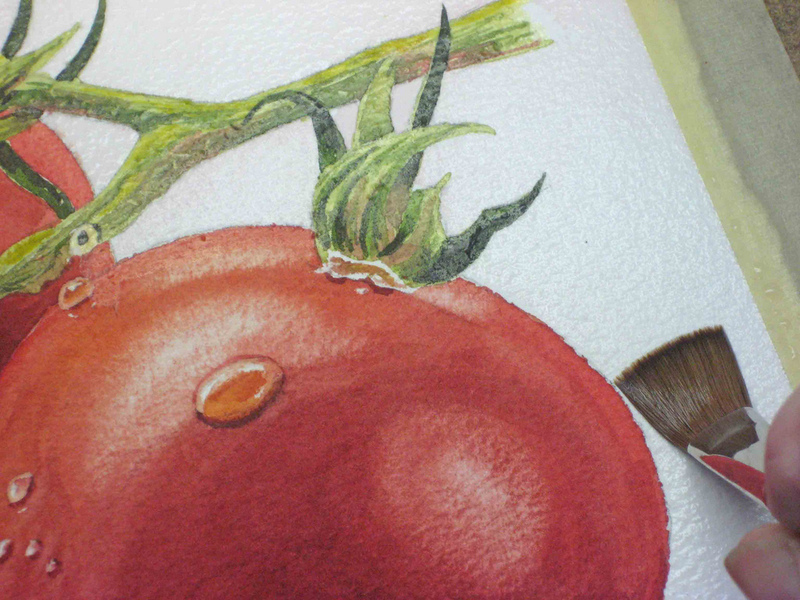 I’m using a 1/2″ flat brush fully loaded with colour and I’m making the right-hand tomato slightly lighter. 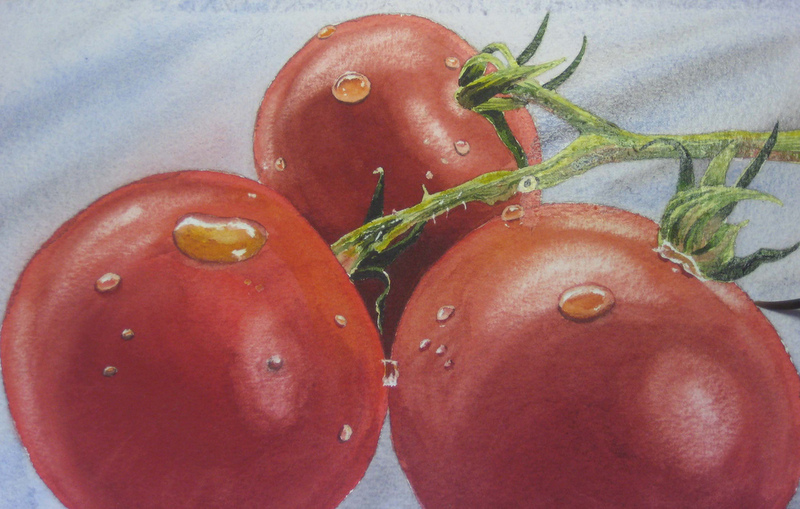 Now I turned my board upside down to carefully paint in the background tomato, after drying off the two foreground images. 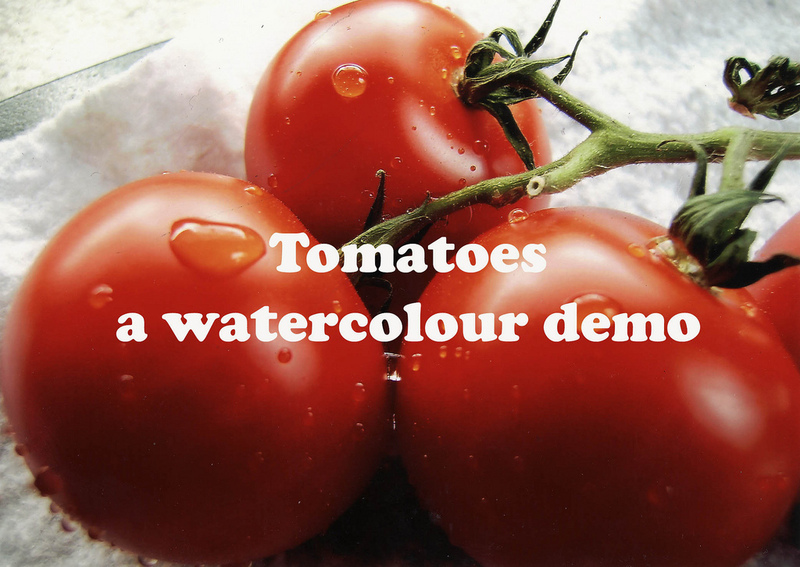 I’m careful not to drag the colour over the edges of the other tomatoes to avoid that outline cartoon look. While my board was upside down I began darkening that background tomato with Winsor Red, plus a shadow colour made from Antwerp Blue and Brown Madder. I usually keep a pan full of this mixture to use in such areas as it darkens the colour without changing the basics. Then I began the gradual build up of colour ready for later lifting techniques which will help make this three-dimensional. 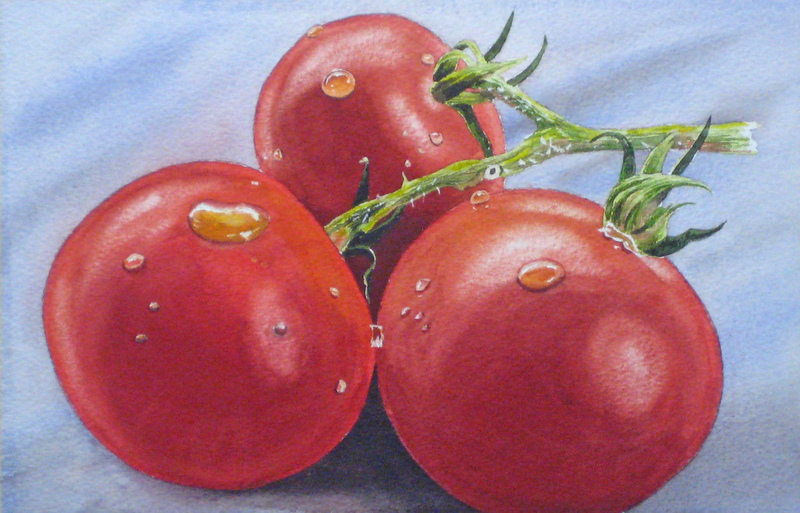 Completing the tomatoes, I blend the results with a plain water to smooth things out. Now I’m lifting out the highlights using a small scrub brush and tissue. My scrub brush is an inexpensive oil brush with the top bristles cut down to make it stiffer. If you’ve never used this technique, practice first on scrap paper as the results will depend on how much colour is being lifted, and you will have to judge how much water and how much pressure to apply with your scrub brush. Here is the first roughed-in highlight area, and now I ready to remove the liquid masking and complete the water droplets. 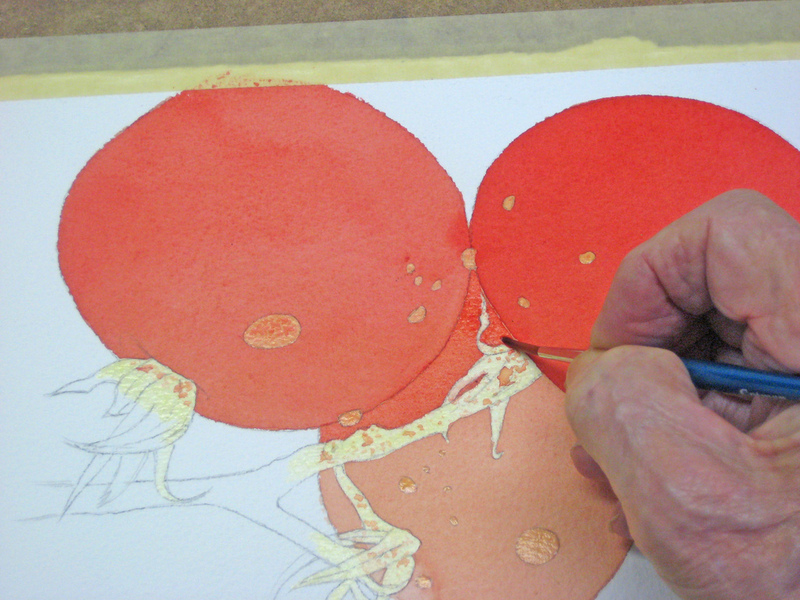 The droplets are an illusion and should be painted in carefully, then an extreme highlight picked out with a knife. This is the advantage with using good quality 300 lb cold pressed paper, which gives you the flexibility to use some of the tricks of the trade. Of course you can use acrylic white if you choose. Nothing wrong in that, but I prefer to let the white paper do the work if I can. Some more modification will be needed on the highlight areas, but now we’re ready to paint in the stem areas and background. The basic wash is made from Aurolin Yellow with a touch of Sap Green, plus a touch of our shadow colour. The stem and leaves are gradually worked up by washes of the same colour only darkened as needed. Notice there is quite a bit of reflected light from the tomatoes appearing along the stems in places. 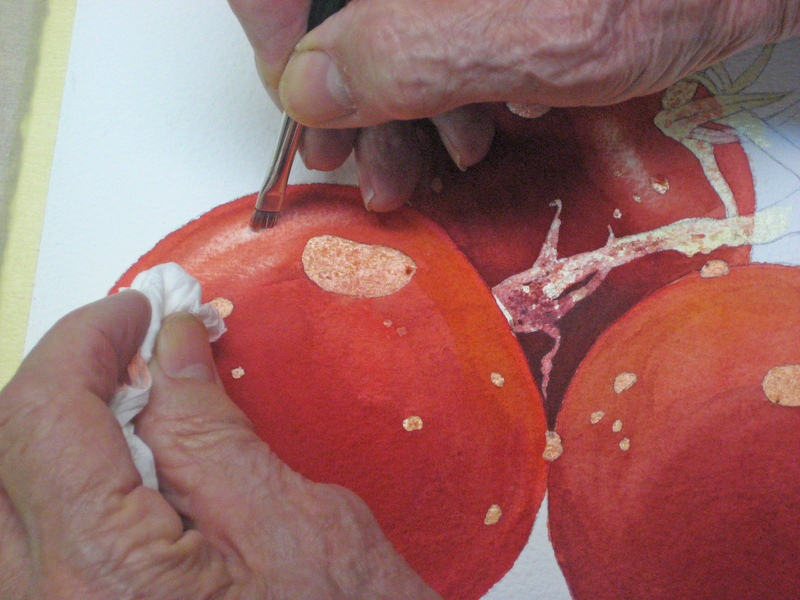 The final touches are put on the stems and leaves, and the tiny hairs picked out with the knife. Now for the background wash.
For most of my background washes completed after a painting is finished, I usually put a wash of pure water over everything, stopping just about 1/16″ from any edges. 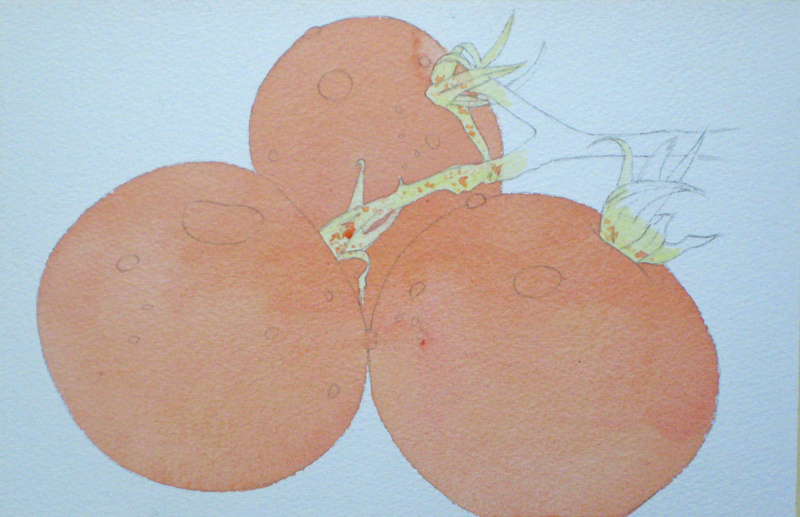 Then I apply the main colour wash, pushing the colour into the little space left. By using a water coat first I’m assured the colour won’t dry in ridges and the colour will follow my water application. 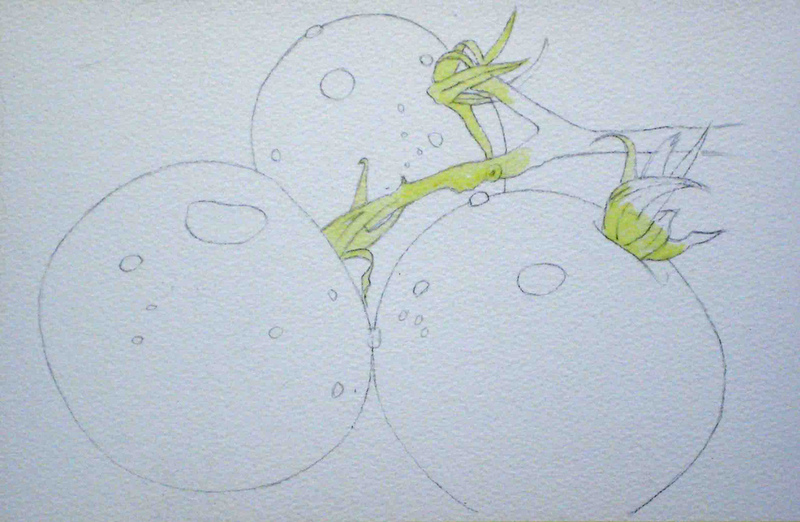 I felt the need to first protect the green stems with liquid masking as I didn’t want the colour to run once the background wash was applied. 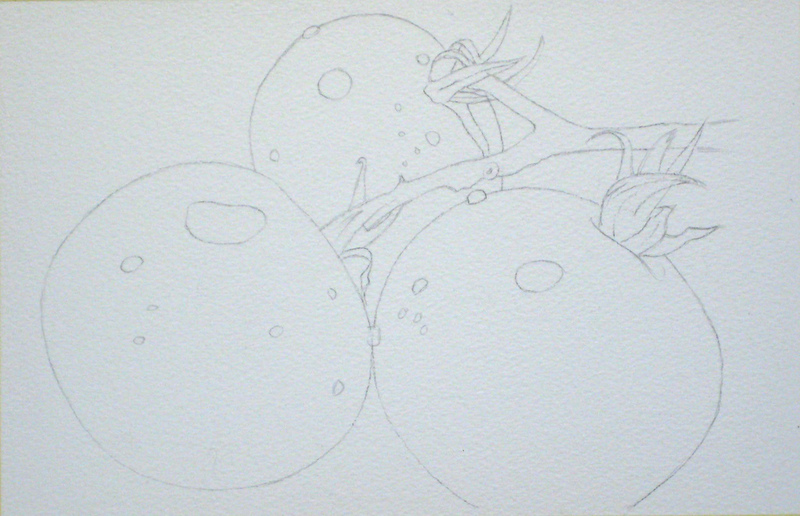 Here is my first background wash, working wet-in-wet.